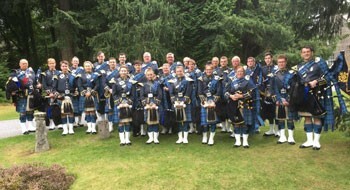 Pipers from the RAF Central Scotland Pipes and Drums are performing at the RAF in Concert tour next week - the last official event celebrating the Royal Air Force's centenary. The concert at the Royal Concert Hall in Glasgow on Wednesday, October 3, is among a wide range of exciting events being staged around the UK this year that serve to commemorate and celebrate the Royal Air Force as well as inspire the next generation of Servicemen and women. The Pipers are joining accomplished musicians from the RAF Squadronaires, Central Band of the Royal Air Force and Salon Orchestra to deliver a rousing finale to the first 100 years of the RAF. The RAF Central Scotland Pipes and Drums have played a major part in all centenary celebrations throughout the year, including parading the 57 Standards and 1,600 RAF personnel down the Mall to Buckingham Palace. Pipe Major Ian Hughes said: "It's an honour to be a part of the RAF in Concert tour and working with our colleagues in the Central Band gives us a great deal of pleasure and pride - especially in such a special year". Concert-goers can also look forward to rousing military marches, toe-tapping big band numbers and timeless military tunes including The Dambusters March and Spitfire Fugue as well as the big band sound of Glenn Miller's In the Mood and Keep 'em Flying. Also taking to the stage will be RAF vocalists Corporal Matthew Walker and Senior Aircraftwoman Philippa Hobbs performing some hugely popular songs including Come Fly With Me, Mr Blue Sky and Miss Otis Regrets. The concert will be conducted by the RAF's Principal Director of Music Wg Cdr Piers Morrell and the compere will be BBC Scotland television presenter, Tony Currie. For ticket details visit the Royal Concert Hall box office at www.glasgowconcerthalls.com or call 0141 353 8000. The concert begins at 7:30pm.